Wayne Gretzky is without doubt the greatest playmaker of all time. 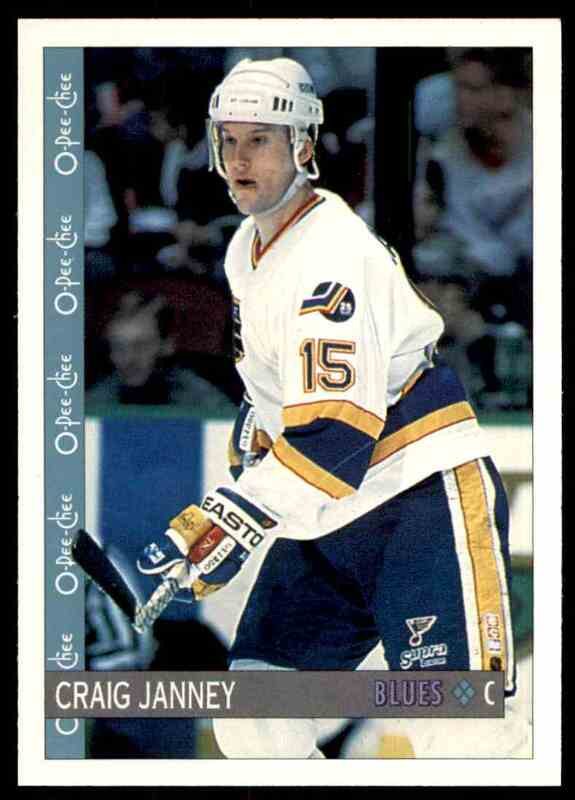 Now Craig Janney certainly isn't the second best of all time, but he may have been the second best of his era. Adam Oates and Doug Gilmour also deserve recognition as the best set up man not named Gretzky in the 1990s. Janney was the puck feeder for some great players, most notably Cam Neely in Boston and Brett Hull and Brendan Shanahan in St. Louis. He was an extraordinary puck master, creating space for his line mates with slick moves. He possessed great hockey sense, much like Hall of Famer Jean Ratelle. Janney was quick to dish off acclaim as he is to dish off the puck. "I've been pretty fortunate to play with some terrific goal scorers," said the unpretentious center. "The guys who pass the puck are only as good as the guys who put it in the net. That's the real hard job, the scoring. I've been fortunate to play with guys like Neely, Hull and Shanahan." However Janney was also labeled as a very soft player. The game plan against Janney was to hit him early and he would not be a factor for the remainder of the game. He would often just turnover the puck rather than take a hit to make a play. During his prime he was more willing to get his face rubbed against the glass, but in his latter years he lost a step and was unable to sneak away from a big hit. That of course, coupled with his spotty defensive play, landed him in many coaches and fans dog house. Janney also takes offense to being labeled soft. "It's a tag finesse players sometimes get labeled with," said Janney. "We take our hits making plays, not by being physical. I'm not going to run over anybody, but I certainly will try to get in their way and take them out of the play. Teammates and opposing players will respect you if they see you taking the extra hit to make a play. Some people don't see it from that perspective." Janney was drafted 13th overall by the Boston Bruins in 1986. After playing 2 years at Boston College, Janney dropped out of school to join the United States national team program, and would have a strong showing there. He not only made the team that would compete in the 1988 Olympics, but starred there, scoring 6 points in 5 Olympic contests! Immediately following the Olympics, Janney turned pro and finished the season with the Bruins. He stepped in and looked like an NHL veteran. He scored 7 goals and 16 points in the final 15 regular season games, and added 6 tallies and 10 helpers as the Bruins went all the way to the Stanley Cup finals! Unfortunately for the B's, the Edmonton Oilers were too strong in the finals. Janney battled a nasty groin injury the following year, but still was strong with 62 points in 62 games, followed by another strong playoff, though the Bruins only made it to the second round that year. But in 1989-90 the Bruins returned to the Finals to once again face the Oilers, only to once again fall to Messier and co. Janney, once again battling the groin injury during the regular season, was spectacular in the playoffs, notching 19 assists and 22 points in 18 playoff games! Janney finally put his groin injury problem behind him and played his first full NHL schedule in 1990-91. He responded well, notching 26 goals, 66 assists and 92 points. He continued his fine play in the playoffs, scoring 4 goals and 18 assists in 18 more playoff games. Craig Janney was dealt halfway through the 1991-92 season. The St. Louis Blues moved fellow playmaker extraordinaire Adam Oates in exchange for Janney and journeyman defenseman Stephane Quintal. Janney was expected to replace Oates as Brett Hull's set up man, as Oates became involved in a bitter contract dispute with the Blues. A funny thing happened though as Janney clicked better with left winger Brendan Shanahan than Hull. Janney enjoyed some fine statistical years in St. Louis. He finished that 1991-92 season with 6 goals and 30 assists in 25 games. The follow year he scored a career high 82 assists and 104 points. He slumped somewhat in 1993-94 due to a sprained knee, but still posted 68 assists and 84 points in 69 games. Despite his great production, Adam Oates was producing even better numbers in Boston, thus making it hard for Janney to get respect with the St. Louis fans and media. A weird thing happened to Janney and the Blues near the end of the 1993-94 season. The Blues signed restricted free agent Petr Nedved from Vancouver and an independent arbitrator named Janney and a second round pick as compensation. Janney however refused to report, and the Canucks swung a subsequent deal to allow St. Louis to keep Janney in exchange for defensemen Jeff Brown and Bret Hedican, as well as young forward Nathan Lafeyette. The Canucks also got to keep the draft pick, which turned out to be Dave Scatchard. Over the summer of '94, the Blues inked Iron Mike Keenan as the team's new boss. Keenan hated anyone that he thought was a soft player, and it didn't take long for Janney (not to mention Brendan Shanahan, Curtis Joseph and Steve Duchesne among others!) to be chased out of St. Louis. "I enjoyed my time in St. Louis very much," said Janney, who totaled 226 points in 178 games with the Blues prior to Keenan's arrival. "It was a difficult situation when I left, but it's one that other players have gone through many times. It's difficult for anyone to go through something like that, but Mike Keenan just didn't want me to play for him." "I asked for a trade to get out of there because I was upset that I was becoming a distraction to my friends on that team," said Janney. "I was making a lot of money and not earning it. Mike Keenan has control of that organization. He is the general manager as well as the coach and is trying to get the guys he wants on that team. That's his prerogative, he's the boss." Janney was sent to San Jose in exchange for mobile defenseman Jeff Norton. In San Jose, Janney took on a veteran's leadership role for the first time in his career. "He is the first star we have had on this team who is still in his prime, and he's been great with the kids," said GM Dean Lombardi. "To some degree his work with our young players has been a very pleasant surprise. The kids all look up to him because it's the first time they've been exposed to a star while he is still in his prime. They all knew what Sergei Makarov and Igor Larionov had accomplished, but it's a bit different with Craig Janney coming in." However Janney never had a star player to set up in San Jose, and that contributed to Janney's less than great production. He scored "just" 18 goals and 82 points in 98 games over 2 years. The Sharks really struggled during Janney's tenure there as the result of some poor drafting and a lack of depth. The Sharks moved Janney to Winnipeg near the end of the 1995-96 season in exchange for defensive forward Darren Turcotte and a draft choice. Janney accompanied the Jets to Phoenix when they became the Coyotes. However his production continued to be less than stellar as he played less and less. His soft play and lack of defensive prowess really hurt him at this late stage of his career as he became more one dimensional than ever, and he was able to produce enough to survive with that lone dimension. Janney split one last season in 1998-99 between two of the worst teams in the league - the Tampa Bay Lightning and New York Islanders. He scored just 5 goals and was often a healthy scratch in both cities. Janney entered the NHL with a bang, but left the NHL with a whimper. Its too bad, he was pretty good during his prime. In 760 NHL games he scored 751 points, 563 of which were assists.